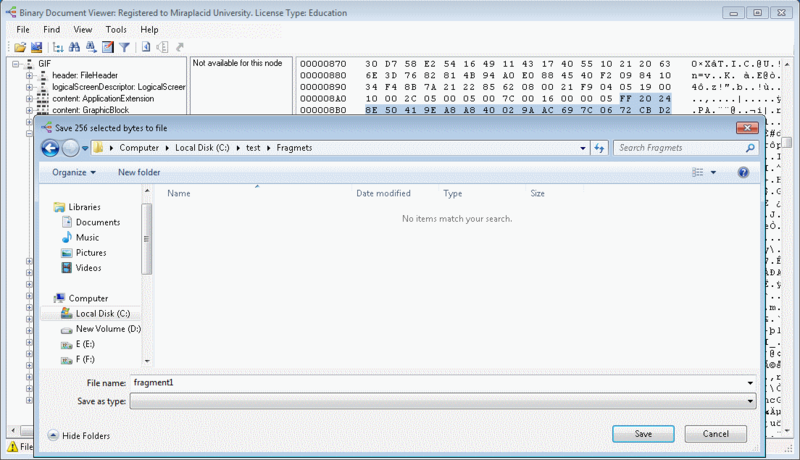 You can save current selection in a hex viewer to a file by pressing Ctrl+S, for by pushing Save As button on a toolbar, or by selecting Save As in File menu, or via popup meny that show up on right click in hex viewer. If you need to save all binary content associated with some structure in a file, just select that node in a tree, and binary content will get selected in the hex viewer. You are not limited to saving content associated with some specific node. You can select any block of bytes in the hex viewer and save it as a file.